Illinois Gov. Bruce Rauner delivers his State of the State address to a joint session of the General Assembly in the House chambers at the State Capitol on Wednesday, Jan. 27, 2016, in Springfield, Ill.
Republican Gov. Bruce Rauner released figures Tuesday detailing how much each Illinois school district would receive next year under his education budget, setting the stage for another battle with Democrats who have their own proposal. The Illinois State Board of Education said the plan calls for increasing funding by $120 million, fully funding the general state aid to schools instead of prorating it like it's been done the past seven years with the state struggling to balance its books. The total budget for schools would be just over $10 billion for the fiscal year beginning July 1, but despite the additional support from the state, wealthy suburban school districts would see a drop in state aid. The governor's funding proposal comes a week after Democrats unveiled their own funding measure, which calls for overhauling the state's nearly 20-year-old formula for sending money to schools. But both Rauner and Democrats, who haven't been able to agree on a budget that should've taken effect last July 1, showed little enthusiasm Tuesday for the other side's plan. Rauner and the four legislative leaders met for about an hour Tuesday afternoon, ostensibly to discuss the budget stalemate, but ended without resolution. Board officials releasing the governor's funding proposal said districts that lose money under the plan have decreased enrollment and fewer students living in poverty. Officials said the schools also have increased local property wealth, which contributes to school accounts. Numbers are not yet available for a rival plan introduced by Democratic state Sen. Andy Manar of Bunker Hill that would send more state money to poorer districts. For the current year, schools have largely been spared the consequences of the state operating without a budget because Rauner signed a spending plan for education while vetoing the rest of the funding package. Rauner has expressed some anxiety about whether schools will open their doors this fall if Democrats who control the Legislature don't send him a spending plan for education or send him one he doesn't like. "Let me be clear. That is wrong. That is baloney. That should never happen. 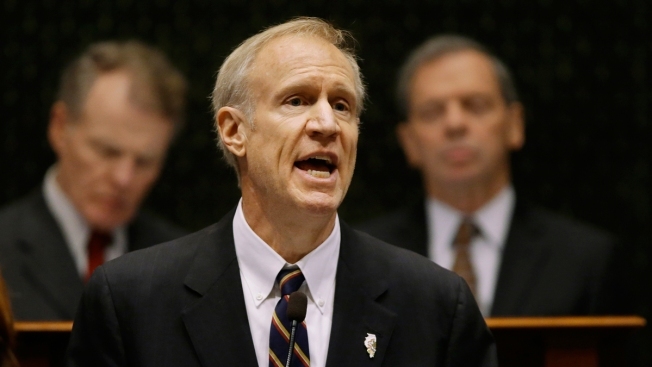 They're trying to create a crisis on the school funding, trying to create a crisis so our public schools don't open to force a tax hike," Rauner told a group of business leaders Tuesday in Springfield. Rauner said he also wants to change the school funding formula but bashed Democrats for not doing it in prior years. "All of a sudden this year is the crisis year," he said. Democratic Senate President John Cullerton, who spoke to the same group of business leaders before Rauner did, told them he's not interested in forcing school closures, but insisted how the state funds education needs to change. "I want to change the formula. It's not fair," he said. Under state law, districts are supposed to get a minimum amount of state money per student. Additionally, some districts get additional funds for other things, like serving high numbers of low-income students, and make up the rest with property taxes. Among other things, Manar's bill would change districts' reliance on property taxes, taking local wealth more into account when distributing funds. The head of the state's largest district, Chicago Public Schools, blasted the plan as continuing a "reverse Robin Hood" education policy where poorer districts lose out. He said Chicago schools — where the vast majority of students are poor and minority — stands to lose $74 million, and noted drops in struggling districts in East St. Louis and North Chicago. "The budget he puts forth continues to cut education funding for poor districts throughout the state of Illinois, including Chicago Public Schools, while increasing funding for wealthier districts," said CPS Chief Forrest Claypool.